Alison and I are taking a break from The Steiner Cafe this month, July. We’re off doing other things like traveling and planning! She and I get to meet up in central Ohio at the Taproot Teacher Training in a few weeks, and after that, we’ll be back here. Posts at The Steiner Cafe will resume on August 13th with reflections on Day Six of the Teacher’s Seminar of 1919. If you haven’t been able to join us thus far, you could use this time as a chance to catch up! The Teacher’s Seminar is the series of lectures Rudolf Steiner gave to the very first Waldorf teachers back in the summer of 1919, and these lectures are published in three books. These days, there are so many possibilities for following along with these lectures. You could purchase all three books and read one day each month along with us. We post at least three times each month, one for each of the three daily lectures. The morning lectures are captured in The Foundations of Human Experience (originally published as The Study of Man); the late morning lectures in Practical Advice to Teachers; and the more informal afternoon sessions in Discussions with Teachers. You could read the books online at www.rsarchives.org (I’ve given you the link to the lecture page). OR, you could grab a cup of coffee or tea and read our reflections on the material here on my blog! 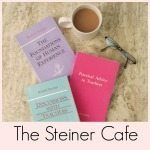 Simply go to The Steiner Cafe page to see all of the previous reflections. Looking forward to meeting you at The Steiner Cafe in August! Remember, we’ll be on Day Six.